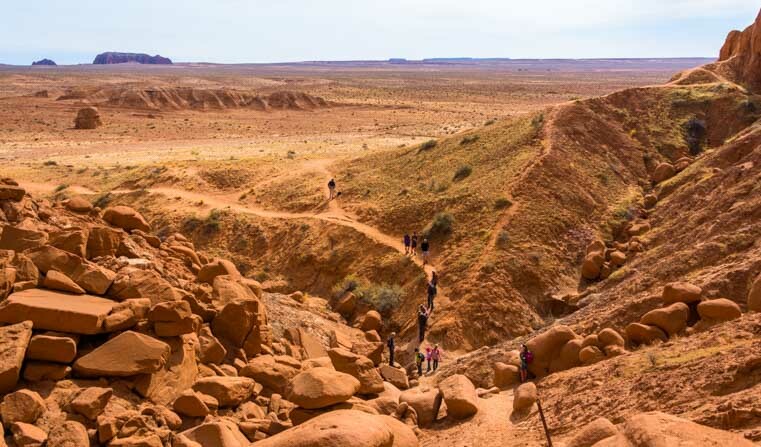 Goblin Valley State Park Utah – One Gigantic Playground! 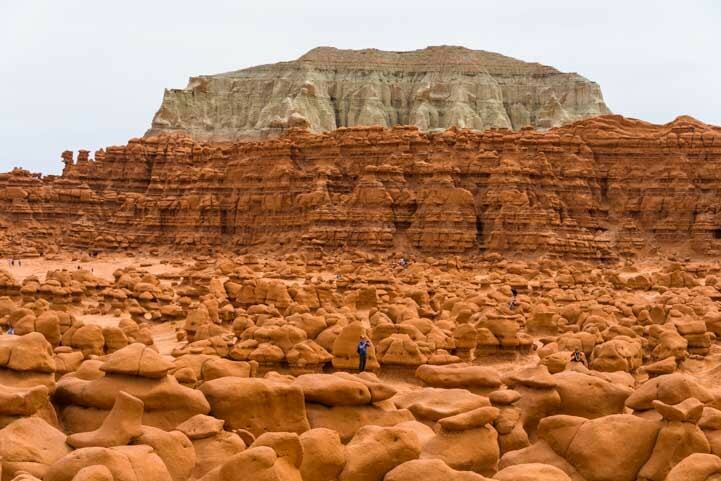 April 2018 – Goblin Valley State Park in Utah is a filled with exotic red rock formations known as “hoodoos” that look for all the world like little people, martians and goblins, and it is a favorite with kids and families because it is one gigantic playground. 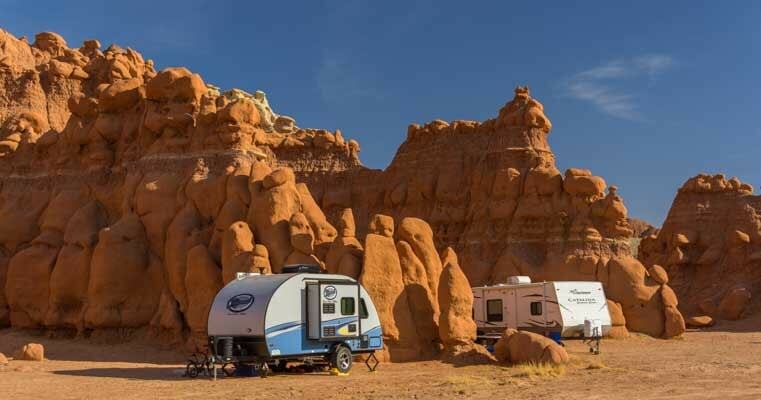 Goblin Valley is a great place for a family camping trip! 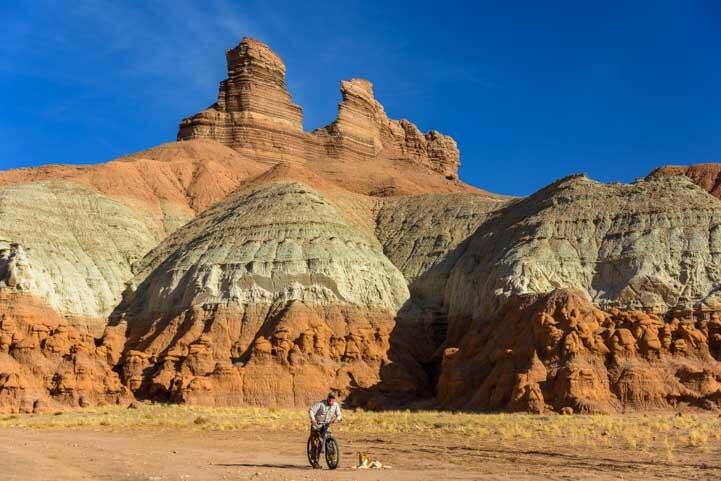 We visited Goblin Valley during our first year of full-time RVing eleven years ago and absolutely loved it. 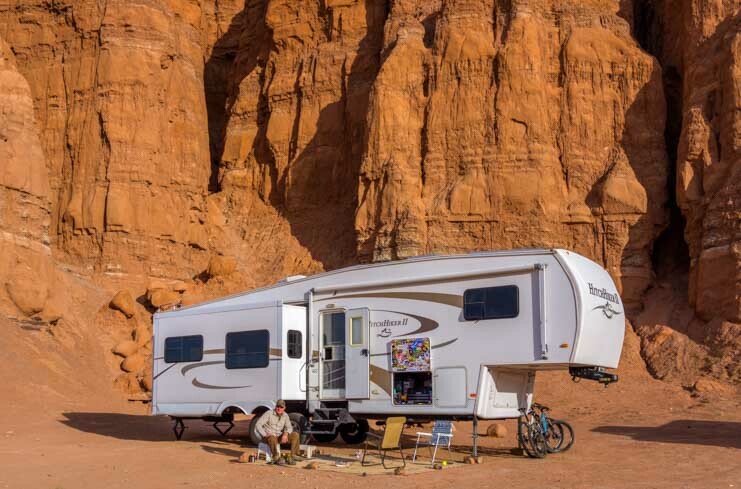 The campground is nestled into a huge rock formation that has cathedral-like buttresses, and tents and RVs tuck into these alcoves for a snug night’s sleep. 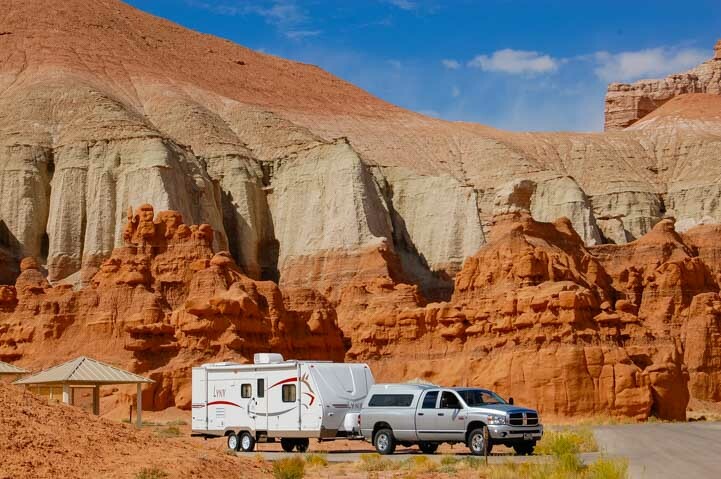 11 years ago we visited Goblin Valley State Park as new full-timers in our 27′ travel trailer and loved it! 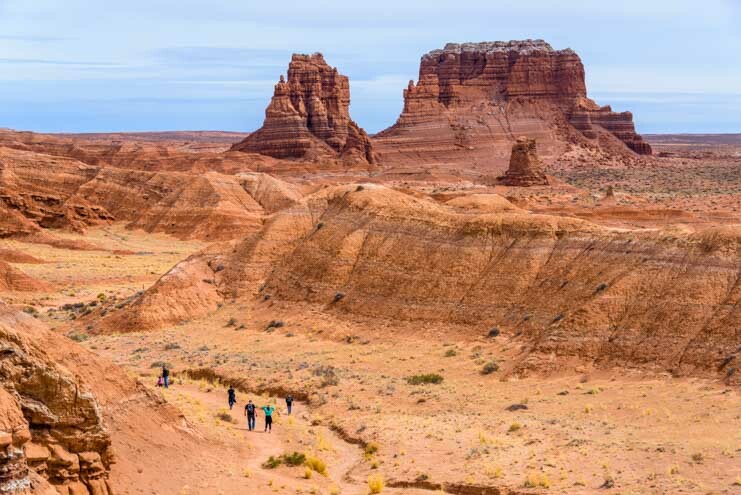 It is located a little away from the concentration of red rock beauty in southern Utah but is an easy detour from I-70 when you’re heading east-west between Utah and Colorado. However, our travels hadn’t taken us in that direction since our first visit in 2007 (blog post here). 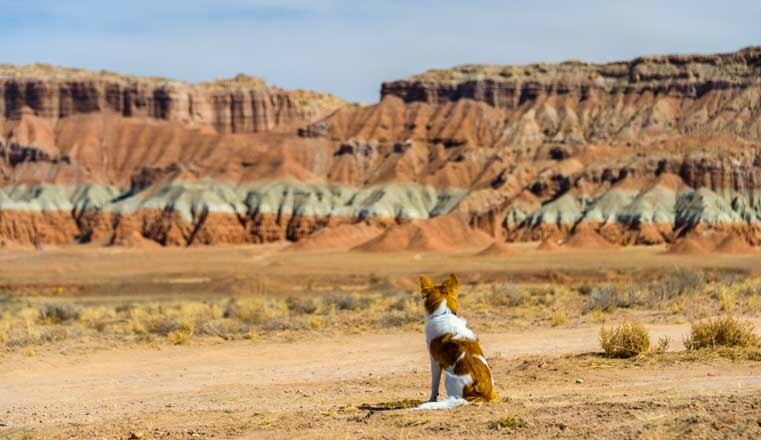 When we pulled into the area we stopped and let our new pup Buddy out, and we all soaked in the dramatic scenery — just gorgeous! Buddy checks out the fabulous scenery. There are wonderful trails to hike or bike on. What a place to ride! 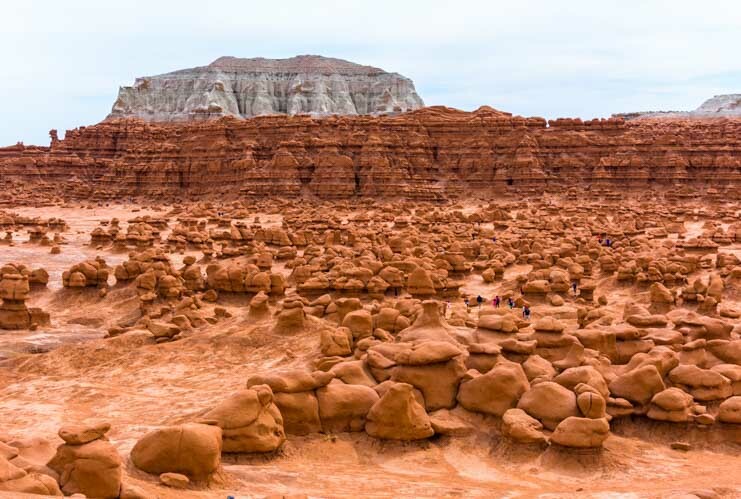 The most famous and iconic part of Goblin Valley State Park is the Valley of the Goblins amphitheater where all the hoodoos stand in a tight huddle, but we decided to do the Goblin’s Lair hike before venturing into the valley of hoodoos. The Greeters welcomed us to Goblin Valley State Park. They are also known as the Three Judges, the Three Kings or the Three Sisters! The Goblin’s Lair hike shares a trail with the Carmel Canyon hike until the two trails fork and the path to Goblin’s Lair takes a right to go around the outside of the hoodoo amphitheater. Here the land is wide open and vast, carved by the massive earth moving forces of Nature, wind and water. A 24-hour hair whipping wind storm had just swept through Goblin Valley, and the dust had been swirling so thickly in the air we had to stay inside for an entire day while our trailer got sandblasted. When we finally ventured out on the Goblin’s Lair hike the next day, the air was so heavy with dust you could taste it on your tongue and feel it on your lips. So, we didn’t have the iconic bright blue sky and crisp colors that set off the red rocks in famously dramatic fashion, but the whole atmosphere was wonderfully ghostly and ghoulish. 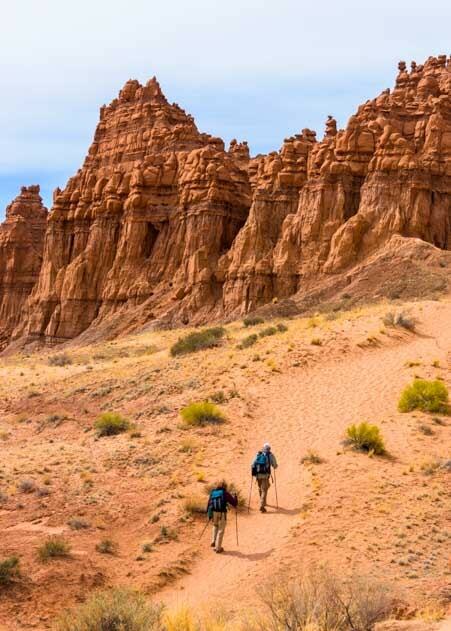 With dust providing a ghoulish haze, hikers head out on the hike to Goblin’s Lair. The trail has several promontories that are fun to walk out on. 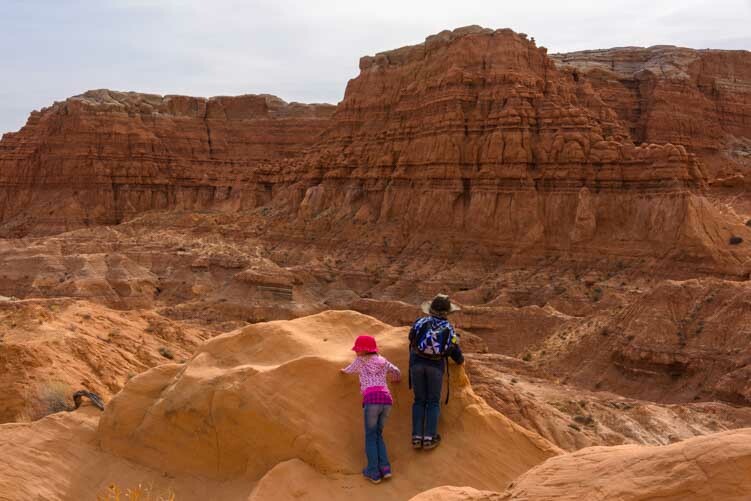 The best way to see Goblin Valley is with kids. Since we didn’t have any kids or grandkids with us, we were delighted to find ourselves sharing the trail with a bunch of families both ahead of us and behind us. 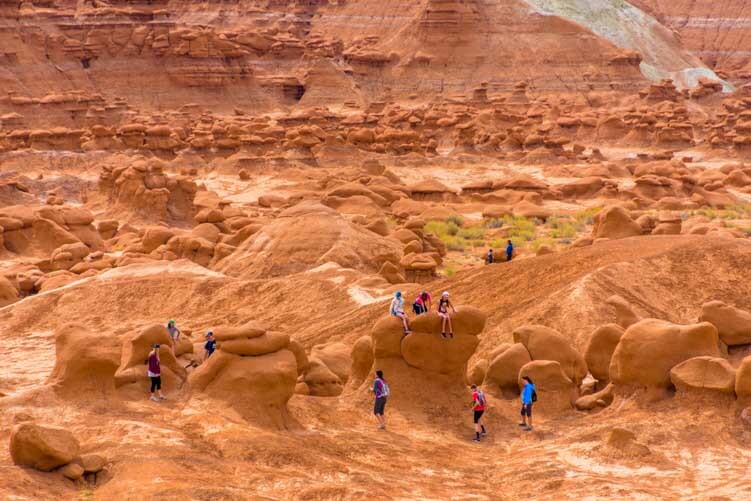 It was Spring Break for the local Utah schools and all of Goblin Valley was teeming with kids. As we started down the trail we heard them excitedly running around and calling out to each other. “Sand, wonderful sand!” one boy said as he scooped up a huge handful of soft pink sand worthy of the best tropical beach and let it fly. Solitary boulders stood here and there. We stopped to trade selfies with some other hikers and then began the ascent up towards Goblin’s Lair. There is a bit of a scramble in the last part of the climb to Goblin’s Lair, but all the grandmas and grandpas made it while their grandkids cheered them on from the top. The lair itself is a big cave, and smart hikers who have read the literature before they start hiking bring flashlights with them. Those of us who just saw the sign “Goblin’s Lair” in the parking lot and started hiking right away ’cause it sounded cool arrived at the cave without one! The crowd at the cave entrance was sizeable. More people kept scrambling up the trail behind us, and we all kept shifting positions perched on the craggy rocks at the top to make room for the new arrivals. Mark and Buddy slithered to the front and took a peek in the cave and said “Wow!” and then we started back down to make room for others coming up. 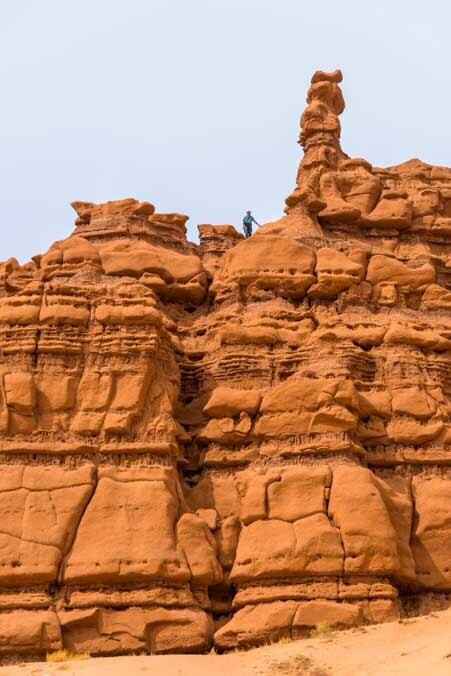 We took our time hiking back and saw people peering down at us from the towering red rock cliffs. 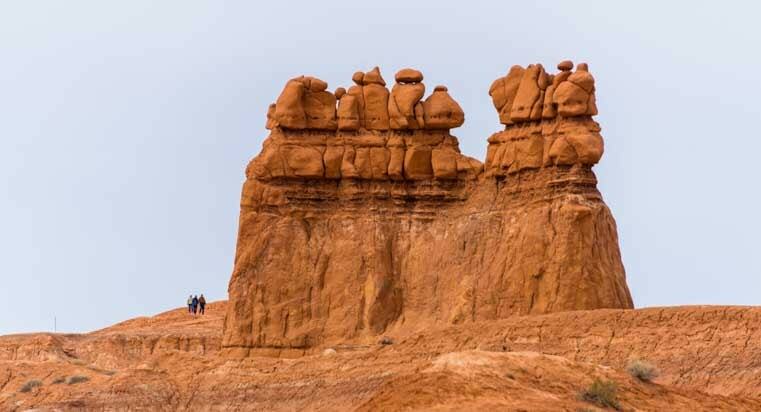 They had climbed up on the cliffs from the crowd of hoodoos on the other side in the Valley of the Goblins. A hiker on the edge of the Valley of the Goblins looks down at us. Solitude in the red rocks with snow in the distance. The hike is three miles round trip, and even though the sun was filtered through the dust in the air, it was getting warm. So, one of us found a bit of cool shade under a rock and took a break. Buddy takes a load off in the shade. 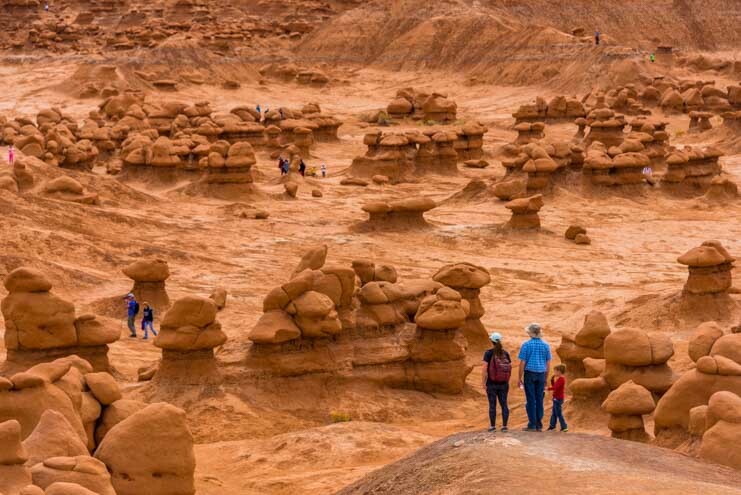 The Valley of the Goblins is the main attraction at Goblin Valley State Park, and you can look down into it from many overlooks at the parking lot before you head on in. Valley of the Goblins with snowy peaks in the distance. 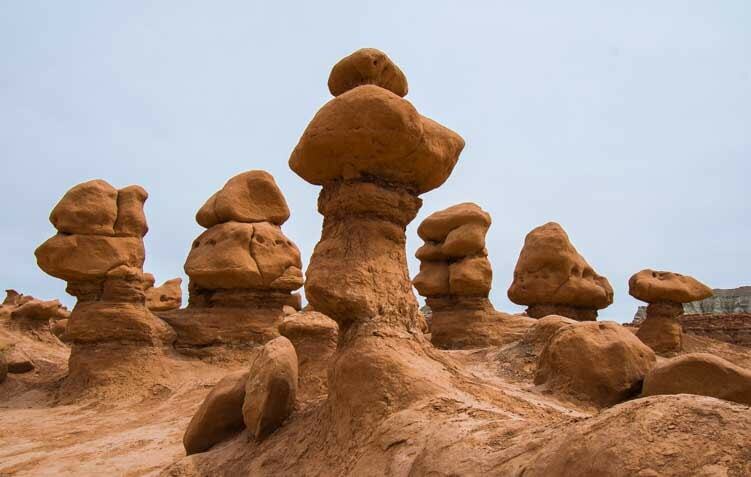 Hoodoos stand cheek-by-jowel in the Valley of the Goblins inviting kids of all ages to climb on them. There is no real hiking trail, just a million goblins standing together waiting for kids to come and play on them. There’s no specific trail in Valley of he Goblins — you can just run anywhere have a ball! 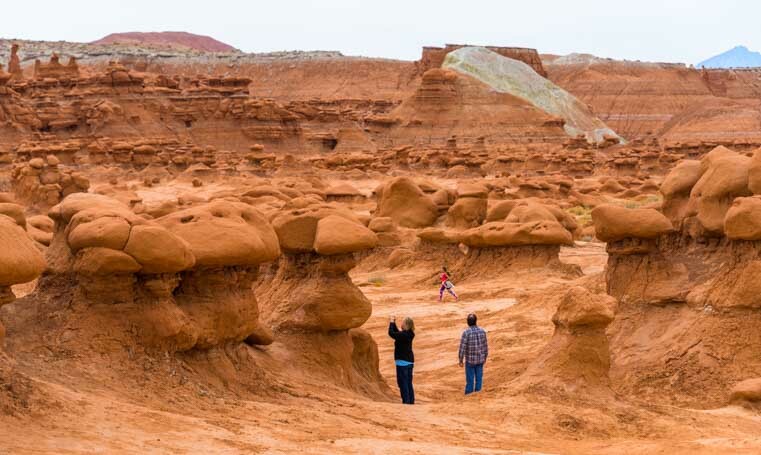 Goblin Valley is a fabulous natural playground. The shrieks of excitement from the kids as they climbed up to the tops and yelled to their friends and parents down below was infectious. There were kids all over the rocks — how fun! 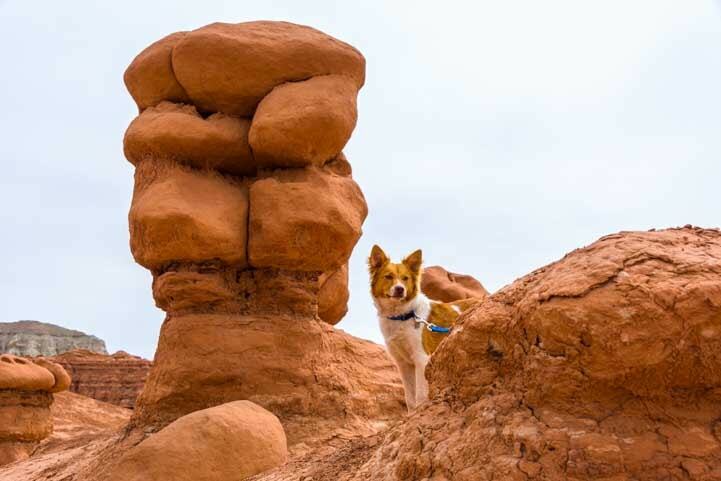 Even kids of the canine variety were having fun climbing the hoodoos in Goblin Valley! The last time we were here we hunted for recognizable shapes among the hoodoos and found space ships and martians and turtles and ducks. That’s the fun of this place. It’s a natural playground for kids of all ages. Your imagination is set free and you can run and climb as much as you want. Or, you can just take photos, and we got a kick out of that too. Out in the middle of it all a hiker captures the scene on his cell phone. 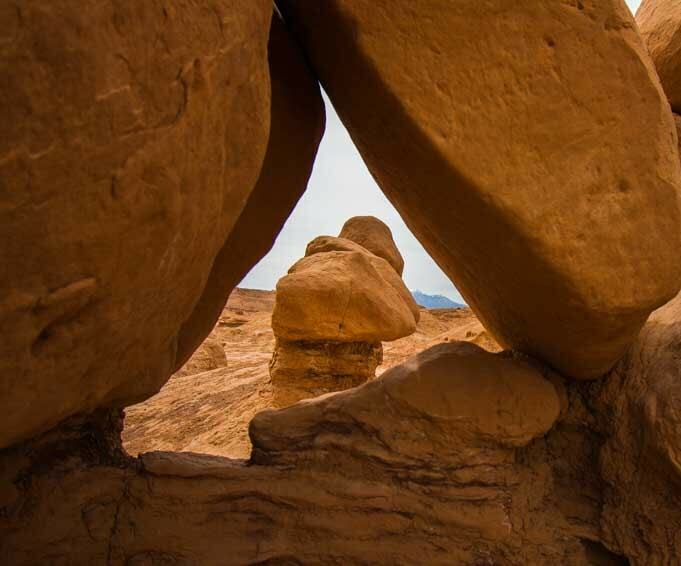 Goblin Valley is a very fun place to get creative with a camera. 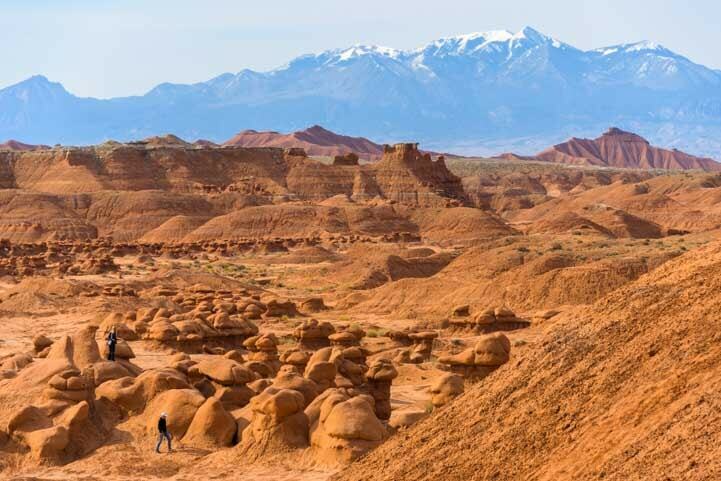 Goblin Valley State Park is a Utah treasure that would easily be declared a National Park if it were located in a less scenic state, and we’ll definitely be back again. 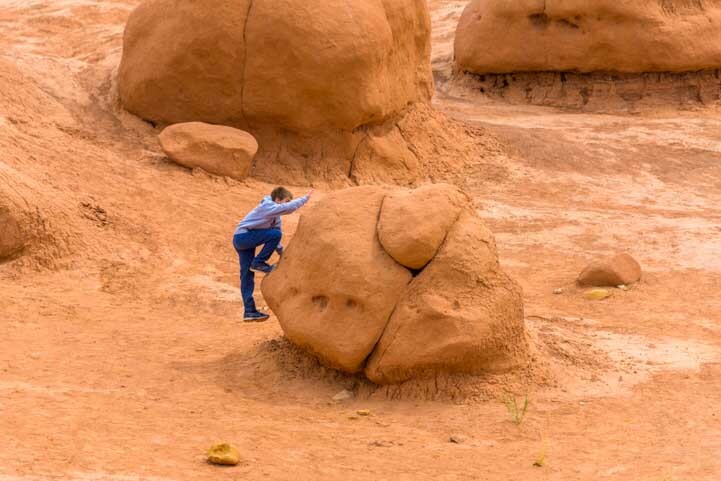 Coming back to Goblin Valley after all these years was a blast! 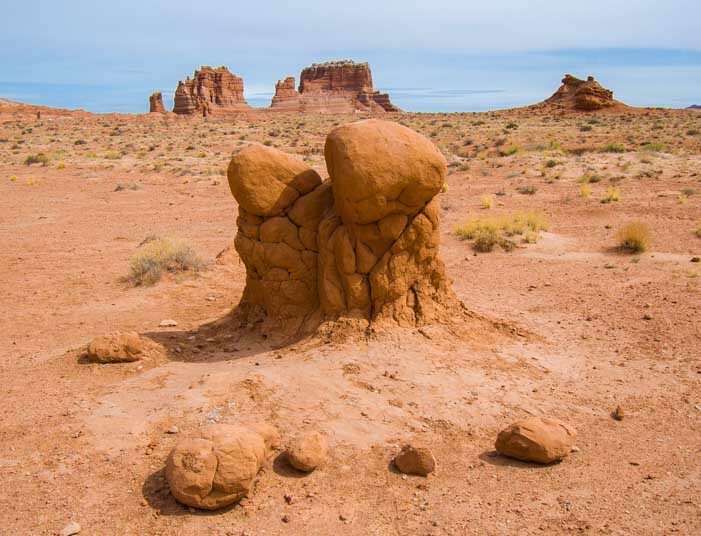 Our first trip to Goblin Valley State Park – Hunting hoodoos! This entry was posted in Utah and tagged Hiking Red Rocks, New, Travel, USA, Utah, Utah Red Rock Parks, Utah Southeast, Utah Southern, WP Travel by Roads Less Traveled. Bookmark the permalink. Well-remember your visit so many years ago….”other-wordly” and “space-trip” come to mind ! It is such a fun place. Every hoodoo has its own personality! Emily and Mark, I just recently stumbled across your blog and have been enjoying both your descriptive writing and your photographs immensely. And, I’ve fallen completely in love with Buddy – what a sweetheart! 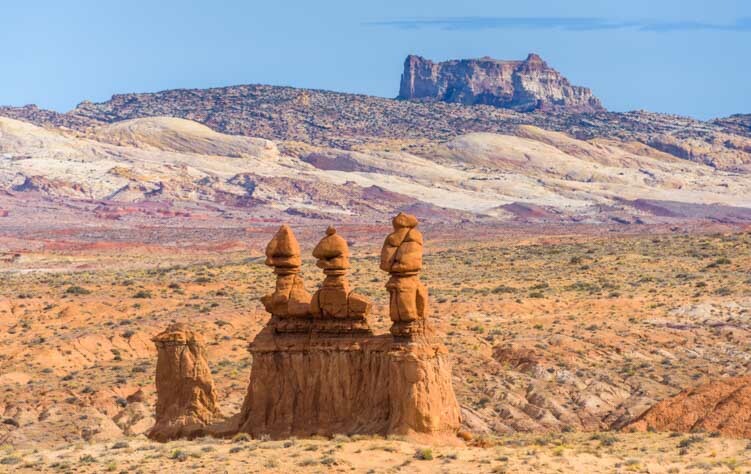 We included Goblin Valley State Park on our 2010 National Parks trip and, although it was a bit out of the way, we were so glad we visited. 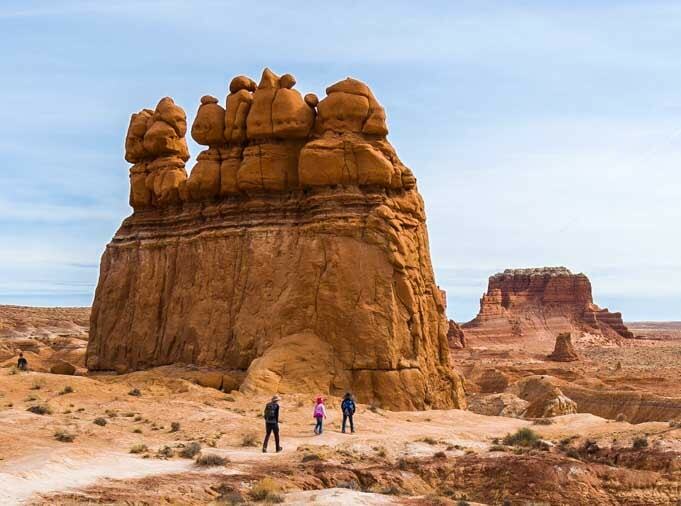 Our kids were 16 and 11 at the time and I’m not sure who enjoyed scrambling around the hoodoos more – the kids or the parents. It really is a magical place! 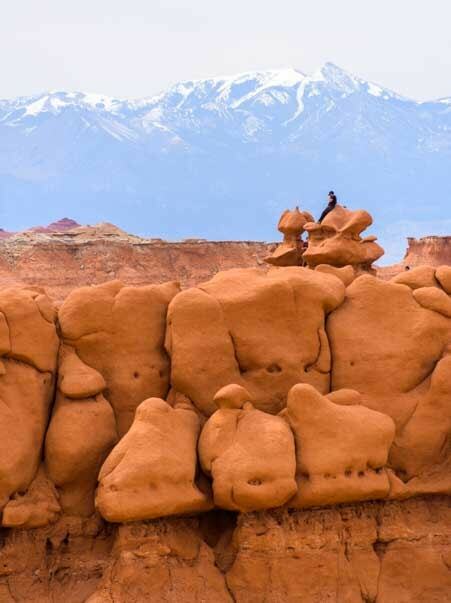 When we return to Utah, you can bet that Goblin Valley will, again, appear on our itinerary. Thanks for sharing such delightful photos! What a great trip that must have been, Mary, and how fortunate your kids are to have played with their parents on those fabulous rocks. I’m sure you’ll relive many wonderful memories when you return!! And thank you for reading our blog and appreciating the pics and stories. Buddy has completely stolen our hearts and we are so incredibly grateful that we have the time and patience at this stage of life to incorporate him into all we do and not have to run off to work all day every day. Happy travels and keep enjoying those campfires!! Great pics, Em. Hard to believe such places exist. It really is, Bob, and the West is full of them. And even after all these years of travel, our eyes still pop and we still have our breath taken away when we gaze out at landscapes like these!! Dont mist Bell Canyon and Great Gallery. They are so beautiful. Have a great time. We hiked the Bell Canyon trail along with Little Wild Horse Canyon years ago and absolutely loved it. We debated doing it again this year but didn’t make it. We’d never heard of the Great Gallery (Horseshoe Canyon) until your comment here. Wow! Looks like a fabulous hike and adventure. Thanks for the tip! How fortunate that you return to “favorites”…new perspectives the second time around ! And now you can share these with – Buddy ! We love returning to our favorite spots, and each time we make new discoveries. Buddy’s easy going, happy and inquisitive nature adds a special new dimension too! Thanks so much for the great stories and the oh so beautiful photography. My wife and I have taken motorcycle trips for 20+ years from our home in Northern IL. and eighty percent of the time we head west. 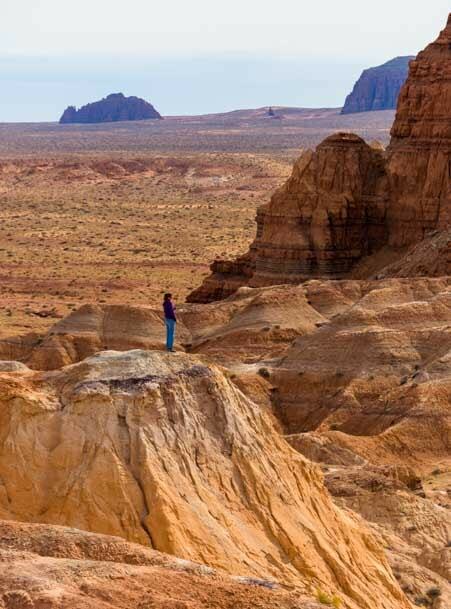 Southern Utah is one of our favorite place to go. Hwy 128 was a favorite with Fisher Towers coming into view on our way to Moab. The Escalante Staircase was also one of our favorite trips. Thanks again for the great posts. You are so very welcome, Rick. Mark’s cross-country motorcycle tours as a kid were part of what prompted his interest in living a traveling lifestyle, and I had a Honda Interceptor 750 in the 1980s that I rode so fast I had to sell it to spare my life. But what a great way to see the world! We often joke that if we get a house someday we’ll go on long motorcycle tours together!! 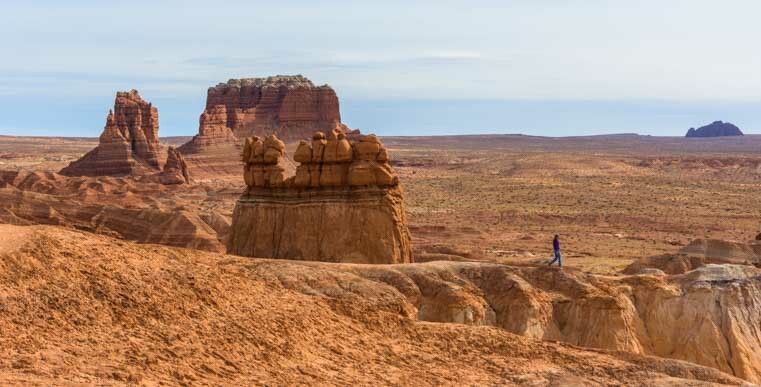 It would be such fun to ride the spectacular Utah scenic drives on two fast wheels, and Utah Hwy 128 would be on our list!! Ahhh, once again our trails *nearly cross! 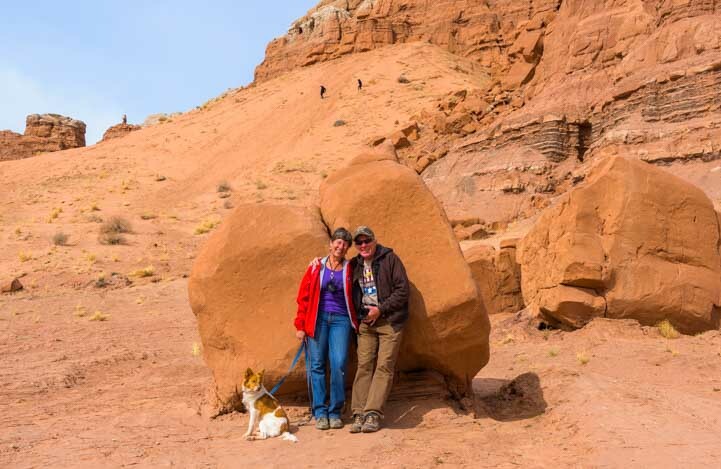 We are in the Moab / Green River area…soooo much to see :)….so little time :/ Thanks for sharing! It’s a fabulous area, that’s for sure! Even if you can’t see it all in this trip there’s always the next trip!!! We’ll be back for more soon. Happy travels to you! Totally unrelated to this post but I’ve been meaning to ask – have you been to the Valley of Names out here in Yuma? No, we haven’t. We’d never heard of it til your comment here. Gosh, another goodie for the bucket list! And this would be why I love Google! We are rockhounds, and there is a type of amber rock around these parts that glows yellow in bright sunlight, so my husband and I have been stockpiling them and will be making our own entry in the Valley this fall when the weather cools. When you next get down our way, please contact us – we would love to meet up. And we hope by then to have a rescue furbaby of our own! 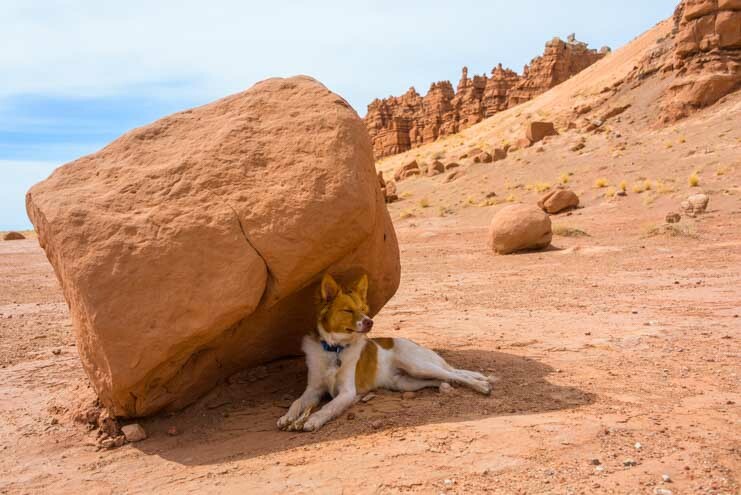 I’m not sure how Google relates, but happy rock hounding for the glowing amber and have fun at Goblin Valley with your soon-to-be new furry friend! Loved this place! We were here with our kids many, many years ago. Just had a blast! Thanks, Debbie. 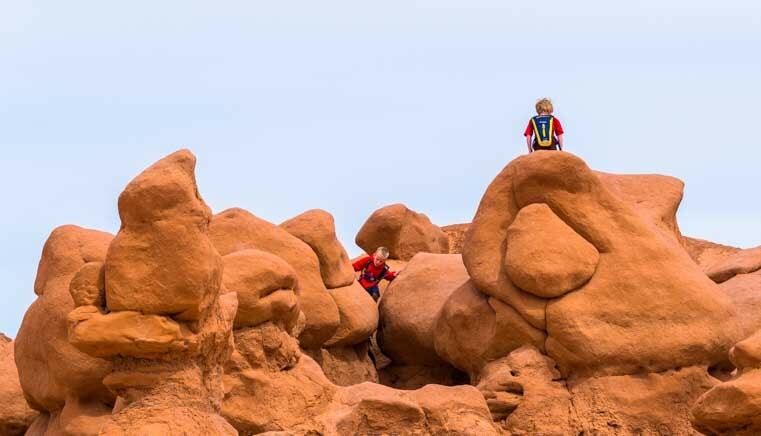 Goblin Valley is such a great place for kids. Last time we were here a kid flew by me running into the mass of goblin hoodoos yelling, “This is HEAVEN! !” That about sums it up, doesn’t it? !